I did my usual endless driving trying to figure out the road system in this part of Canmore, very confusing. I finally found a good spot to park, leaving a hike of about 600m. I used a combo of trails, golf cart roads and bushwacking to get to the cache, man, that last 150 m was steep! I found the nicely cleaned off cap and enjoyed the terrific views for a while. Thanks for selecting this survey control monument for your BCP series ofth, it sure is in a beautiful spot. 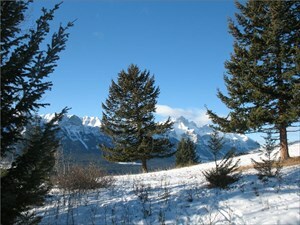 A beautiful view of Rundle Mtn today.